Jamie Smith is Vice Chairman - Texas of the Firm. 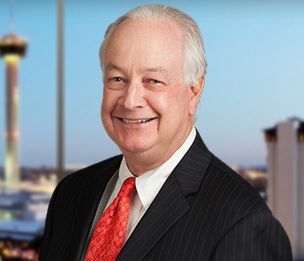 In addition to his law practice, he focuses on assisting with strategic expansion of the firm's Texas-related business. Mr. Smith is a widely recognized corporate attorney experienced in business transactional matters, including mergers and acquisitions, corporate governance, crisis management, formation and financing of start-up and venture backed companies and counsel regarding implementation of strategic business initiatives for companies of various sizes in multiple industries. Former Chairman and Managing Director of Cox Smith, 2005-2015. Led the restructuring of governance and ownership in complex multi-generational family businesses, including a large meatpacking company, a multi-location restaurant operation and a construction services business. Serves as outside general counsel for a leading, Texas-based private biomedical research institution. Serves as outside counsel to the Board and senior leadership of the nation's largest municipally-owned utility. Led internal investigation regarding alleged misconduct related to expansion of large infrastructure project. Representation of a beverage distribution company in acquisitions of additional distribution territories through stock and asset acquisitions. Represented independent exploration and production (E&P) companies in public securities offerings, note offerings, asset acquisitions and dispositions, corporate governance, and Board-related matters. Served as outside general counsel for a large regional discount retailer in connection with general corporate and compliance matters, Board matters, securities matters such as an initial public offering and 1934 Act compliance and corporate representation in connection with two Chapter 11 proceedings. Represented a large regional cafeteria operator in connection with Board governance, 1934 Act compliance, and general corporate matters. Represented a national fast-food franchisor in connection with general corporate and securities matters, including in connection with a hostile takeover by a competitor. Representation of clients in structuring and documenting acquisitions, dispositions, partnerships and joint ventures in diverse industries, including energy, distribution, food service and real estate. Representation of companies relating to public and private offerings of securities and 1934 Act compliance matters.